Shkorpilovtsi is a resort village, that is located 40 km southern from Varna. The main part of the village is 2 km away from the beach, and the resort part is directly near the sea. It was known as Funduklii, which has turkish origin, and means hazeinut garden. Near the village were found ruins from 4 ancient villages. The village is a good place for relaxing holiday, because it combines a green nature and a beach landscape. There are a rest stations, camps and a hotels. The location makes it perfect for vacations, because in the area there are a some other interesting resorts and attractions. On the beach there is a pier, which is part of the scientific station – built in 1982. 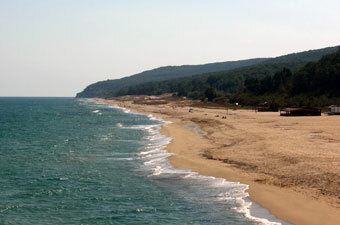 The area has the longest sandy beach in Bulgaria – about 12 km. The estuary of Kamchia river flows into the sea, and long the shores grow dense longose forests. They are extremely rare phenomenon in temperate latitudes. The forests are so dense wet and difficult to pass that resemble the jungle. The area is unique because of impressive landscapes, which provide sea view, beautiful deep river and green forest. Except the dense plants the area has a rich animal world – there over 25 species in the river, about 200 species birds, 56 of them are endangered. Varna is located only 30 minutes away by rental car from Shkorpilovtsi. It is the sea capital of the country and is economic and cultural centre. In Varna and around, there are a lot of attractions: Sea Garden, Dolphinarium, The Cathedral, Historical museum, Necropolis of Varna, shopping centres and others. Shkorpilovtsi offers a lot of camp lagers and bungalows. If you plan to visit Shkorpilotvsi and have not yet booked your car, you can do so by using our reservations left. If you are traveling from Varna, LowCostCars has an office to Tsar Osvoboditel 17 A, or from the airport, where you can pick up your car on the spot. Shkorpilovtsi is the perfect destination for a day trip from Varna.